As Stewart Dental Laboratories transitions to a Full Service Dental Lab we are adding many new products. 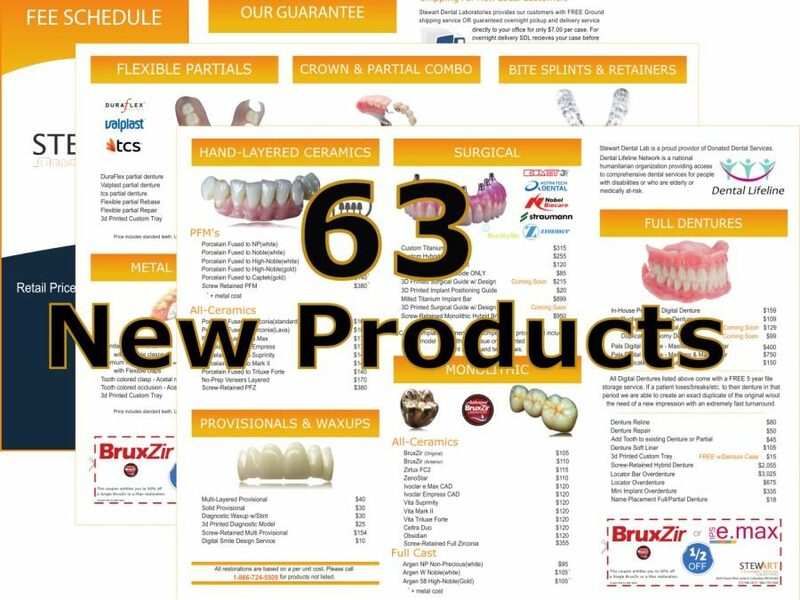 Today we have added 63 New Products and have reflected it in our Retail Price Sheet. If you need a new one please give us a call and we will be happy to update you with the new products offered. Just to mention a few are In-House Digital Dentures, Metal Partials, tcs and Valplast Partials, Locator Bar Overdenture’s, Denture Reline and Repair, Digital Smile Design Service, Non-Branded 3D Printed Models, Triple Layer Sports Mouthguards, Mora/Gelb Appliance and many, many more. We will be updating the website to reflect the new products but please bare with us since the list is so big and the list will be growing in the process. Our Outsource sales sheet for lab’s and dentist’s will be updated in the very near future as well.